UN Week is nearly here! From the Pope, to Putin, to Peacekeeping, here are the big stories that will drive the diplomatic agenda in Turtle Bay. UN Week kicks off on a high note on Friday, with the opening of a special summit on the Sustainable Development Goals. Pope Francis will be one of the first to address the summit on Friday morning. President Obama is helping to close the session on Sunday. In between are over 150 speakers, mostly heads of state. The SDG summit is a very big deal for the United Nations, and quite possibly for all of humanity. It is the culmination of over two years of negotiations over what should replace the Millennium Development Goals, which expire at the end of this year. The SDGs — or, the “Global Goals,” as the advocacy community has taken to calling them — are an aspirational set of 17 goals and 169 targets that every country on the planet is pledging to work toward from now until 2030. The top goal is nothing less than the total eradication of extreme poverty (as defined by people living on $1.25 per day), and each of the goals have embedded in them principles of environmental sustainability. Eliminating diseases like HIV and Malaria; sharply reducing maternal mortality rates; and substantially increasing renewable sources of energy are just a few of the 169 targets to which the most important global leaders are signing their names. It’s a massively ambitious agenda and if it’s achieved, life for most of the 8 billion on earth in 2030 will be vastly improved. It all starts with the Pope’s speech on Friday. Every UN Summit since 2012 has included important meetings about the conflict in Syria and its humanitarian consequences. But this time something is different: after four years of conflict and over 4 million refugees, the crisis in Syria has suddenly became a political and humanitarian crisis in Europe. For the United Nations, the Syrian refugee crisis is part of a deeper and more endemic challenge to the humanitarian relief system. Globally, there are more refugees and displaced in the world today than at anytime since World War Two. The Syria conflict is by far the largest driver of displacement. But conflict in Iraq, South Sudan, a horribly abusive regime in Eritrea and the Nepal earthquake have created an unprecedented strain on the patchwork of NGOs and UN agencies that deliver humanitarian aid. At the heart of this crisis is donor fatigue. For Syrian refugees alone, donors have only contributed $1.8 billion against a $4.5 billion appeal. This massive funding gap has translated into less aid–including a reduction in food aid for Syrians living in Lebanon. Ban Ki Moon will host yet another high level meeting on the Syrian humanitarian crisis on the sidelines of the General Assembly. The meeting is scheduled for September 30. A number of heads of state and foreign ministers will be in attendance, and we can expect some new pledges of humanitarian assistance ahead of this meeting. This year, though the “high level meeting” will be far more politically resonant to Europe than in years’ past for the simple fact that the Europeans are finally feeling the consequences of letting the Syrian conflict fester unabated for nearly half a decade. On Monday afternoon, after his speech to the General Assembly, President Obama will host a special summit on UN Peacekeeping. Strengthening the institution of UN Peacekeeping has been a key priority of President Obama’s since his first UNGA in 2009, when he held a reception for the top troop contributing countries to UN Peacekeeping. Last year, Vice President Biden chaired a meeting of dozens of countries that pledged to increase their contributions to UN Peacekeeping. This meeting is being similarly billed as a “pledging conference” — but this time, Obama will be presiding so the pledges and participation will likely be more substantial. 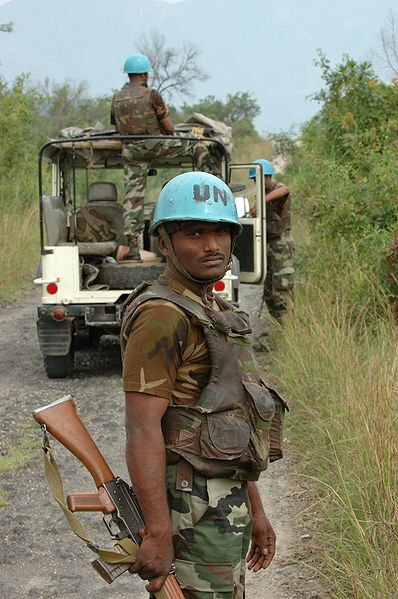 At issue is the fact that UN Peacekeeping is under severe strain. There are over 100,000 Blue Helmets deployed to 16 missions worldwide. Most of these Blue Helmets are from the developing world, with units generally under equipped or lacking certain capacities, like helicopters. The USA has very few troops deployed to peacekeeping missions–about 80 — but it is the largest financial contributor to peacekeeping, ponying up about 28% of of $8 billion price tag. President Obama is hosting this conference to leverage new contributions to UN Peacekeeping particularly from European countries, which have largely stayed out of peacekeeping for the last 20 years. A key metric of success for this pledging conference will be the extent to which European countries feel compelled to make meaningful new contributions of sophisticated units or assets that are sorely needed by UN Peacekeeping. Vladimir Putin will make his first visit to the United Nations in ten years. The Russian leader will address the General Assembly on Monday and likely focus his remarks on Syria, specifically the need to support forces inside Syria that are fighting the Islamic State. For Russia, that means bolstering the Syrian government, a proposal that USA and its European allies are loathe to support. Russia also happens to hold the rotating presidency of the Security Council this month. On September 30th, Russian foreign minister Sergei Lavrov will chair a meeting of the Security Council focused on terrorism in the middle east. This meeting wont move the needle on Syria, but it will be clarifying. Expect Russia to forcefully insist that the West is obsessed with the removal of Assad to the detriment of the fight against ISIS; and expect the USA and its European allies to make the case that Assad’s crimes created the context from which ISIS emerged and draws strength. As has been the case of the previous four years, the sharp divide between Russia and the west is what has paralyzed the Security Council from taking meaningful steps toward a diplomatic solution to this crisis. With Putin joining Obama in New York, expect those differences to be even more sharply manifest. 5) Who’ll Replace Ban Ki Moon? This will be Ban Ki Moon’s second to last UNGA, and last UNGA before he’s relegated to lame duck status. Though it’s not on any formal agenda, expect many backroom discussions over not just who should replace Ban as the next Secretary General, but how that decision will be made. Since the founding of the United Nations 70 years ago, the permanent five member of the Security Council have exercised exclusive control over process of selecting a Secretary General. It’s been done largely in secret and without much input from the rest of the world. This year might be different. For several months, key UN member states (including the UK) have backed proposals to open up the process. On September 11th this year, the General Assembly adopted a resolution calling on each UN member state to receive basic information about the candidates and asking the Security Council to set a clear timetable for selecting Ban’s replacement. This may seem like a baby step, but it’s a big change over how things have been done since 1945. The question of who may replace Ban Ki Moon is a tough one. There is mounting pressure–even from Ban Ki Moon himself–that Ban’s replacement ought to be a woman. Also, by tradition (though not any binding, formal agreement) 2016 is supposed to be Eastern Europe’s turn to hold the spot. That has put the Bulgarian UNESCO chief Irina Bokova and Croatia’s foreign minister Vesna Pusić as early front runners. Other names being floated include Former New Zealand prime minister and UNDP administrator Helen Clark and Alicia Barcena, a UN diplomat and former environment minister of Mexico. Don’t expect any huge movement on this question in the coming week. But do expect questions of process to be raised by member states, in both public and private throughout the week.